With our customers always at the forefront of our mind we thought we needed to tell you about this amazing deal we got our hands on and how it affects you. IT DOES NOT AFFECT THE PRICE OF OUR HAMPERS AT ALL. How brilliant is that! A variety of our bigger baskets which originally contained the Triple Chocolate Indulgence have now been upgraded to The Exquisite Edition chocolates with no additional costs to you! Although many of our gift baskets have been enhanced unfortunately we can not upgrade all of the hampers containing the original product as the basket in which they are placed in are not big enough to fit the enhanced box. The contents of each of our hampers and gift baskets are like a jigsaw puzzle, placed to fit within its basket perfectly. For this reason our bigger gift baskets and hampers have been upgraded to the bigger box of chocolates. 108g grams of chocolatey goodness made by one of Ireland’s finest chocolatiers is always a welcome component of any gift hamper we send out. 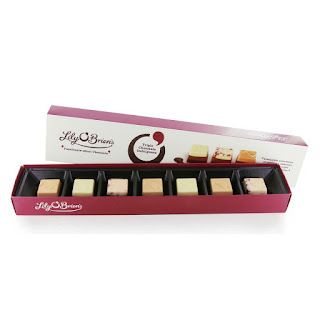 A trio of tangy raspberry, traditional combination of dark, milk and white chocolate all encompassed in one and an indulgent caramel complete the chocolates in this selection. 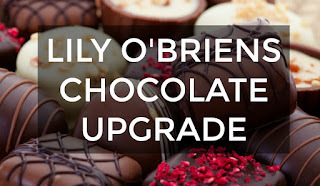 A reasonable price at €5.00 for gourmet chocolates working out at €.071 per chocolate. A whooping 300g worth of delectable chocolates in The Exquisite Edition.This array of chocolates contains exotic ingredients harvested in far off lands and simple ingredients obtained from the Irish countryside delivery a taste journey which is intended to inspire and excite. Fifteen delectable delights can be found within the Exquisite Edition from a creamy white chocolate sprinkled with delightful raspberry pieces and infused with zesty lemon to chocolates which would more traditionally be found in a box chocolates such as a roasted hazelnut praline studded with crispy wafer pieces and coated in a silky milk chocolate. The recommended retail price for the 30 chocolates is €17.95 working out at only 59c per chocolate! 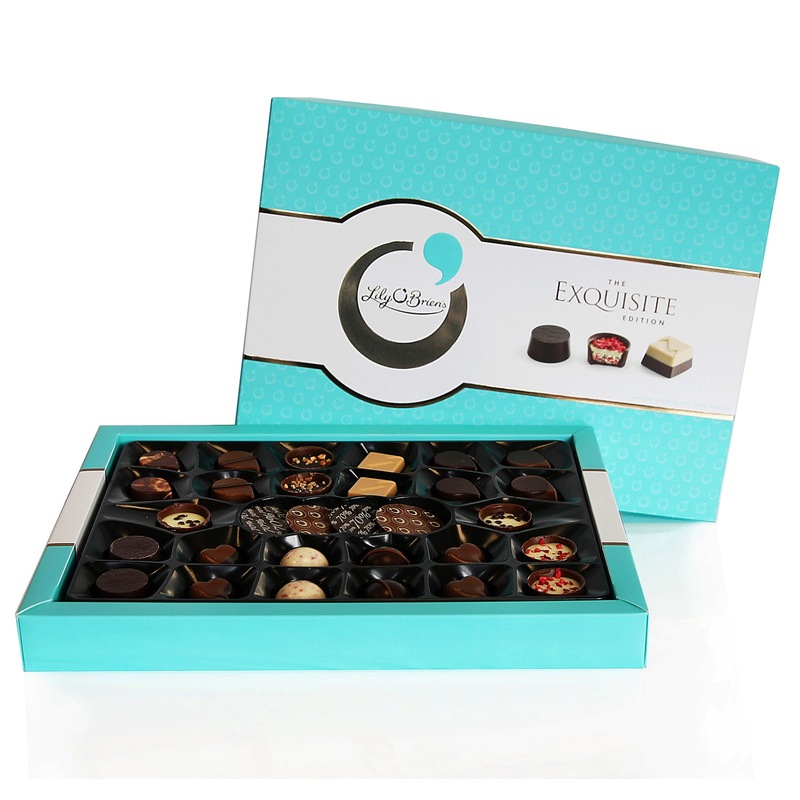 An exciting assortment of well loved traditional chocs and exciting new world additions. This is an upgrade that will leave your family jumping for joy. Above you can see not only the difference in the size of packaging but also with the quality. This upgrade is amazing and we are so fortunate to have availed of this opportunity. It is even better for you as our original price has not increased. If you have purchased one of these hampers for Christmas over the past couple of weeks and the order has not yet gone to the recipient your order will be upgraded. 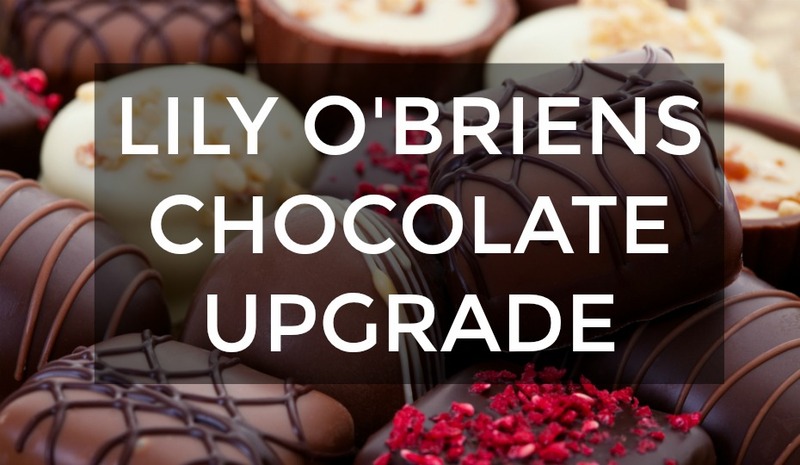 This offer can only last for a limited amount of time as we only have a limited number of these chocolates - once they are gone, they’re gone! Get your order in quickly to avoid disappointment.